I restart my computer after it's been on for over a week I then reboot everything up and right as I boot up my games server I get a pop-up saying Microsoft Windows Firewall is now blocking my server software from accessing the internet and asking If I want to confirm whether it blocks it or not so I allow the server software access, however ever since then no body has been able to connect to the server even though Port Forward Network Utilities confirms the port my server uses is open. So I go to see about turning Microsoft Windows Firewall off and NOPE, can't turn Microsoft Windows Firewall off because why? I'll post a screenshot explaining why. Re: What the hell is this?! Norton running "two" firewalls now? Please by all means share the so called "brilliant" wisdom that made you think it was a good idea to have TWO firewalls running? So as a gamer and doing server hosting if something cannot access the internet I now have to figure out if it is Nortons firewall that's blocking it or if it's Microsoft Windows Firewall blocking it and then have to set firewall rules for either one or both firewalls. 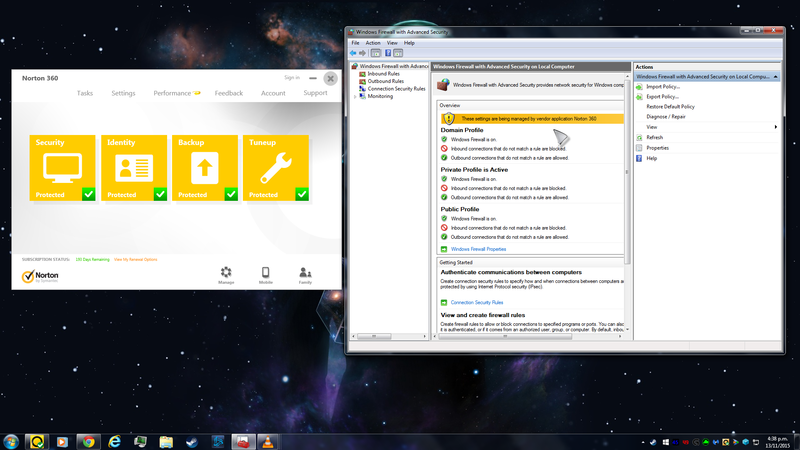 Or is it that Norton no longer has a firewall and is now having all that controlled and updated by Microsoft? In my opinion Microsoft Windows Firewall would be better managed by the Anti-virus program that Microsoft has, so tell me why I shouldn't delete Norton 360 and go buy Microsofts Anti-virus softeware or some other companies Anti-virus software since Symantec no longer has any confidence in their own firewall and is now either using Microsofts one or using both firewalls which is incredibly stupid and very user unfriendly. P.S. If you couldn't figure the picture out here's the answer: I can't turn off Microsoft Windows Firewall because Norton 360 is controlling it. Now have Windows Firewall off and my dedicated server is now working as intended. Still would like to know why Norton switched it on to begin with. Clearly shows in the picture provided that Microsoft Windows Firewall is on, on top of me getting pop ups from Microsoft Windows Firewall asking me if I agree to it blocking my dedicated servers. Play ignorant all you want but that picture does not lie. Okay, try this. On my machine. Profiles are Windows Firewall defaults. And Windows Firewall is managed by Norton. What I am seeing is Microsoft Windows Firewall telling me that it is blocking my Dedicated Server and coming up with a pop up asking If I wanted to disable the rule. "Windows Firewall has blocked some features of this program"
Why do you think I suspected it was Microsoft Windows Firewall? what do you think lead me to Microsoft Windows Firewall? It was Microsoft Windows that showed me the message, not a Norton message a Microsoft Windows message, which indicates on my computer that Microsoft Windows Firewall is very much active because it was actively blocking my dedicated server and blocking the ports that the server uses when 3 weeks earlier I made a Traffic rule to open the specified port (as well as a port mapping rule in the modem itself) and a Program rule to allow the Dedicated server software access on Norton and in Norton history at the time of the Microsoft Windows message Norton showed it allowed the program access and allowed it to use the specified port. It was not Norton 360 telling me it is blocking it. It was Microsoft Windows Firewall telling me it was blocking it, as it was a Microsoft Windows message.